Crystal Palace have failed to win in their last 8 matches in Premier League. Huddersfield have scored 38% of their goals in the first 15 minutes in Premier League. Manchester City have scored 2 goals or more in each of their last 7 home matches in Premier League. 35% of Watford’s conceded goals occurred after the 75th minute in Premier League. 69% of Crystal Palace’s matches had under 2.5 goals in Premier League. Huddersfield have lost 57% of their home matches in Premier League. 73% of Brighton & Hove’s points have been earned at home in Premier League. Brighton & Hove have lost 71% of their away matches in Premier League. 65% of Leicester City’s conceded goals occured in the first half in Premier League. Crystal Palace have failed to score in 83% of their home matches in Premier League. 64% of Huddersfield’s conceded goals occured in the first half in Premier League. 29% of Leicester City’s conceded goals occurred in the first 15 minutes in Premier League. 65% of Watford’s conceded goals were conceded at home in Premier League. Manchester City have won 85% of their matches in Premier League. Burnley have failed to win in their last 6 matches in Premier League. Manchester City have won their last 5 matches in Premier League. Manchester City have been undefeated in their last 13 matches in Premier League. Crystal Palace have lost 67% of their home matches in Premier League. Huddersfield conceded at least 1 goal in 71% of their home matches in Premier League. 80% of Manchester City’s conceded goals were conceded at home in Premier League. Manchester City have scored the opening goal in 85% of their matches in Premier League. Manchester City were leading at halftime in 77% of their matches in Premier League. Crystal Palace have failed to win in their last 6 home matches in Premier League. Burnley have scored 62% of their goals in the first half in Premier League. 69% of Huddersfield’s matches had under 2.5 goals in Premier League. Manchester City have won their last 7 home matches in Premier League. 78% of Crystal Palace’s points have been earned away in Premier League. Huddersfield have scored 75% of their goals in the first half in Premier League. Manchester City have scored 2 goals or more in each of their last 3 matches in Premier League. 77% of Bournemouth’s matches had over 2.5 goals scored in Premier League. Bournemouth have conceded 2 goals or more in each of their last 3 matches in Premier League. Huddersfield have failed to score in 71% of their home matches in Premier League. 33% of Bournemouth’s conceded goals occurred after the 75th minute in Premier League. Newcastle Utd conceded at least 1 goal in 86% of their home matches in Premier League. 62% of Newcastle Utd’s conceded goals were conceded at home in Premier League. Crystal Palace have scored 75% of their goals away in Premier League. Huddersfield have scored 75% of their goals away in Premier League. Newcastle Utd have scored 73% of their goals in the first half in Premier League. Manchester Utd have scored in each of their last 7 away matches in Premier League. Newcastle Utd have lost 71% of their home matches in Premier League. Newcastle Utd have scored 45% of their goals in the first 15 minutes in Premier League. West Ham Utd conceded at least 1 goal in each of their last 7 matches in Premier League. Southampton have failed to win in their last 9 matches in Premier League. Crystal Palace conceded at least 1 goal in 83% of their home matches in Premier League. Southampton have failed to score in 50% of their home matches in Premier League. West Ham Utd conceded at least 1 goal in 100% of their away matches in Premier League. Southampton have failed to win in their last 6 home matches in Premier League. 77% of Manchester Utd’s matches had over 2.5 goals scored in Premier League. 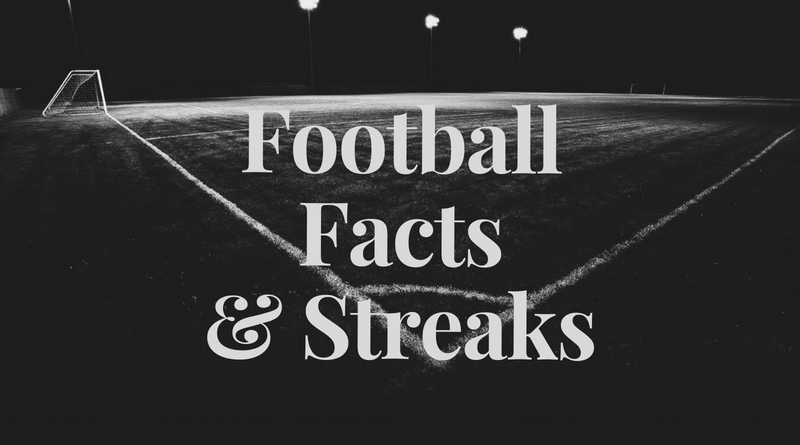 SPAL have conceded 2 goals or more in each of their last 4 matches in Serie A.
Juventus have won 100% of their away matches in Serie A.
Empoli conceded at least 1 goal in each of their last 10 matches in Serie A.
Bologna have failed to win in their last 6 matches in Serie A.
Fiorentina have failed to win in their last 6 matches in Serie A.
SPAL have conceded 2 goals or more in each of their last 4 home matches in Serie A. 83% of Empoli’s points have been earned at home in Serie A.
Juventus have scored 2 goals or more in each of their last 6 away matches in Serie A.
Empoli have lost 67% of their away matches in Serie A.
Fiorentina have drawn their last 5 matches in Serie A.
Juventus have scored 2 goals or more in each of their last 4 matches in Serie A. 73% of Bologna’s points have been earned at home in Serie A. 50% of Fiorentina’s conceded goals occurred after the 75th minute in Serie A.
Juventus have won their last 4 matches in Serie A.
Bologna have conceded 2 goals or more in each of their last 4 away matches in Serie A.
Fiorentina have scored in 100% of their home matches in Serie A.
Juventus have been undefeated in their last 13 matches in Serie A.
Bologna have scored 27% of their goals in the first 15 minutes in Serie A. 77% of Fiorentina’s matches had under 2.5 goals in Serie A.
Juventus have scored in each of their last 13 matches in Serie A.
Valencia did not concede any goal in 67% of their away matches in La Liga. 85% of Valladolid’s matches had under 2.5 goals in La Liga. Getafe have scored 42% of their goals after the 75th minute in La Liga. Espanyol have scored in each of their last 8 matches in La Liga. Valladolid have failed to score in 50% of their home matches in La Liga. 85% of Leganes’s points have been earned at home in La Liga. Getafe have failed to score in 67% of their home matches in La Liga. Espanyol have scored the opening goal in 77% of their matches in La Liga. 84% of Real Madrid’s conceded goals were conceded away in La Liga. Leganes have lost 71% of their away matches in La Liga. 92% of Getafe’s matches had under 2.5 goals in La Liga. 85% of Valencia’s matches had under 2.5 goals in La Liga. 75% of Getafe’s goals have been scored in the second half in La Liga. Espanyol have scored in 86% of their away matches in La Liga. Valencia have been undefeated in their last 5 away matches in La Liga. Getafe have scored 67% of their goals away in La Liga. Valencia did not concede any goal in their last 4 away matches in La Liga. Dortmund have been undefeated in their last 12 matches in Bundesliga. Freiburg have scored in each of their last 5 away matches in Bundesliga. Hannover 96 have scored in each of their last 8 matches in Bundesliga. Hertha Berlin have conceded 2 goals or more in each of their last 4 matches in Bundesliga. Werder Bremen have scored in each of their last 12 matches in Bundesliga. Bayern Munich conceded at least 1 goal in each of their last 8 matches in Bundesliga. Dortmund have scored in each of their last 10 matches in Bundesliga. 67% of Bayern Munich’s matches had over 2.5 goals scored in Bundesliga. Dortmund have scored 34% of their goals after the 75th minute in Bundesliga. Hannover 96 conceded at least 1 goal in each of their last 10 matches in Bundesliga. Bayern Munich have scored the opening goal in 75% of their matches in Bundesliga. Dortmund have conceded 2 goals or more in each of their last 3 home matches in Bundesliga. 75% of Hannover 96’s matches had over 2.5 goals scored in Bundesliga. Dortmund have scored 2 goals or more in each of their last 6 home matches in Bundesliga. 35% of Hannover 96’s conceded goals occurred after the 75th minute in Bundesliga. Bayern Munich have scored 2 goals or more in each of their last 3 away matches in Bundesliga. 75% of Dortmund’s matches had over 2.5 goals scored in Bundesliga. Hertha Berlin have failed to win in their last 6 matches in Bundesliga. Monaco have failed to win in their last 7 home matches in Ligue 1. 80% of Montpellier’s conceded goals occured in the second half in Ligue 1. Monaco have conceded 2 goals or more in each of their last 3 home matches in Ligue 1. Lyon have scored the opening goal in 71% of their matches in Ligue 1. 35% of Angers’s conceded goals occurred after the 75th minute in Ligue 1. Caen have failed to win in their last 6 matches in Ligue 1. Monaco have scored 31% of their goals after the 75th minute in Ligue 1. Montpellier have scored in 83% of their away matches in Ligue 1. Lille have scored 71% of their goals at home in Ligue 1. Monaco conceded at least 1 goal in 86% of their home matches in Ligue 1. Monaco have failed to score in 43% of their home matches in Ligue 1. Montpellier have scored the opening goal in 71% of their matches in Ligue 1. 70% of Monaco’s points have been earned away in Ligue 1. 85% of Monaco’s goals have been scored in the second half in Ligue 1. 73% of Lille’s points have been earned at home in Ligue 1. Monaco conceded at least 1 goal in each of their last 6 home matches in Ligue 1. Preston have scored in each of their last 11 matches in Championship. Bolton conceded at least 1 goal in each of their last 9 matches in Championship. Norwich City have been undefeated in their last 7 matches in Championship. Rotherham have drawn their last 3 away matches in Championship. Reading conceded at least 1 goal in 89% of their home matches in Championship. Stoke City have been undefeated in their last 6 away matches in Championship. Preston have been undefeated in their last 9 matches in Championship. 28% of Bolton’s conceded goals occurred in the first 15 minutes in Championship. Rotherham have been undefeated in their last 7 matches in Championship. Preston have scored 74% of their goals at home in Championship. Bolton have failed to score in their last 4 home matches in Championship. 85% of Rotherham’s points have been earned at home in Championship. Preston have scored in each of their last 5 away matches in Championship. Bolton conceded at least 1 goal in 78% of their home matches in Championship. Rotherham have scored 78% of their goals at home in Championship. 78% of Rotherham’s goals have been scored in the second half in Championship. Rotherham have lost 67% of their away matches in Championship. Preston have been undefeated in their last 4 away matches in Championship. Bolton have lost their last 4 home matches in Championship. Rotherham have failed to win in their last 9 away matches in Championship. 68% of Bolton’s matches had under 2.5 goals in Championship. Rotherham have scored 33% of their goals after the 75th minute in Championship. Reading have lost 56% of their home matches in Championship. Stoke City have scored in 89% of their away matches in Championship. 31% of Preston’s conceded goals occurred after the 75th minute in Championship. Bolton have failed to win in their last 9 matches in Championship. 33% of Kilmarnock’s conceded goals occurred in the first 15 minutes in Premiership. Livingston have failed to score in their last 4 matches in Premiership. Hibernian have scored in 71% of their away matches in Premiership. Kilmarnock conceded at least 1 goal in 83% of their home matches in Premiership. 74% of Livingston’s points have been earned at home in Premiership. 80% of Livingston’s conceded goals were conceded away in Premiership. Kilmarnock conceded at least 1 goal in each of their last 5 home matches in Premiership. 69% of Livingston’s matches had under 2.5 goals in Premiership. 67% of Kilmarnock’s conceded goals occured in the first half in Premiership. Livingston have failed to score in 43% of their home matches in Premiership. 77% of Estudiantes’s matches had under 2.5 goals in Primera Division (Argentina). Lanus have drawn their last 3 away matches in Primera Division (Argentina). 31% of Estudiantes’s conceded goals occurred after the 75th minute in Primera Division (Argentina). 69% of Lanus’s matches had under 2.5 goals in Primera Division (Argentina). 69% of Estudiantes’s points have been earned at home in Primera Division (Argentina). Lanus have scored 30% of their goals in the first 15 minutes in Primera Division (Argentina). 85% of Banfield’s matches had under 2.5 goals in Primera Division (Argentina). 77% of Estudiantes’s goals have been scored in the second half in Primera Division (Argentina). 61% of Lanus’s conceded goals were conceded at home in Primera Division (Argentina).